There are two ways I present Math in Your Feet. The first way is to upper elementary students. In this version, the five-day residency revolves around the creative problem solving process of making our own percussive dance patterns. Along the way, this pattern-focused process engages students in a flurry of mathematical activity within the dance making itself. In addition, relevant math ideas/facts are identified and/or folded in to the experience to help describe, inform and improve our creative work. The second way I present the program is to teachers. In the current version, our 3-hour workshop revolves around giving educators an experience of making math and dance at the same time; I lead teachers through the same core Math in Your Feet lessons as I do the students. This is a program about learning while doing so it makes sense that if you're interested in teaching the program to your own students, you need to have experienced the work first hand. 1. Three hours is enough time for experiencing Math in Your Feet, but not much more. We need another session for processing that learning and what it means for students, making connections between the dance work to other ways we do and learn math (especially on the page) and hashing out all the permutations of classroom implementation. 2. On the whole, people will see the math with which they are already familiar in the work they are doing, often geometry. 3. Math in Your Feet is not a geometry unit. 4. It's time I made this fact more explicit. 5. When I can clarify for others the core of the learning that occurs while making math and dance at the same time I will finally have the conceptual base for creating a meaningful learning experience for teachers as learners first. 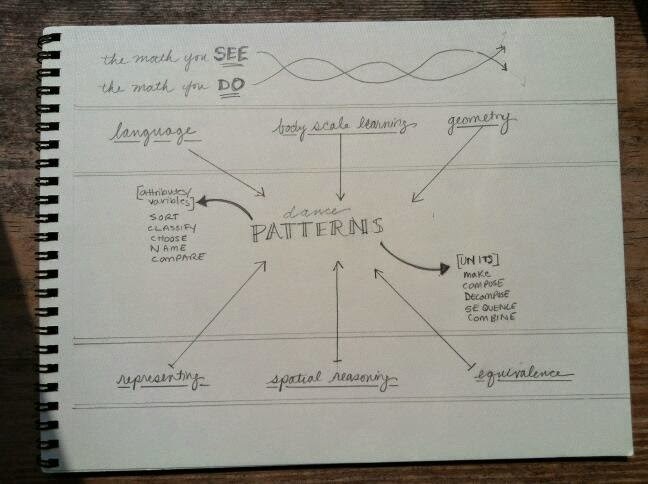 An in-depth inquiry into patterns is at the core of the program. We spend the entire first day understanding how these patterns are built and structured, and how we might go about making our own. We begin to understand that within a single beat in a dance pattern we can describe that one moment in at least three different ways (foot position, type of movement or direction). This is the essence of mathematical abstraction. This program is not about any one mathematical topic or strand or subject, it is simply about how we think when we do math. This thinking occurs when we use attributes and variables to make, compare, compose, decompose, sequence, combine and discuss our Patterns A & B. This thinking also occurs when we sort, classify, choose, name and compare the variables/attributes that make up these dance patterns. This thinking happens in the conversations and creative work within partner teams of two and in the active observation and analysis of patterns during our sit-down group observation and discussion times. "What does it mean to dance the same as my partner?" "How do you know that pattern was reflected?" "It looked like both the A and the B patterns in their Pattern C were the same, but let's take a closer look and figure out if that's so. If not, how are they different from each other?" In the end, it all boils down to clarifying the relationship between the math we see and the math we do. The math we see are the "mathematical objects" that can be identified, named, memorized, tested, and are often the 'things' we hold before others as proof of learning. Many of these things are important, but they in and of themselves are only half the picture of what it means to learn math. The math we do in Math in Your Feet? Those questions that spark inquiry, noticing, wondering and new questions? This is the process side of math, the action part, the really, truly, super fun part. It doesn't matter whether it's dancing or daily number routines, or working out how many different kinds of hexagons you can make with pattern blocks, or anything else. No matter the vehicle, this is how we think when we do math. My goal now is to make this process side explicit and to figure out how to design an inquiry for teachers that revolves around the dance making but is as intellectually engaging for the adults as the inquiry I have developed for students. And when I can figure that out, we are going to have SO. MUCH. FUN.